Get more for less with the Sunny health and fitness SF-RW5633 air rowing machine. 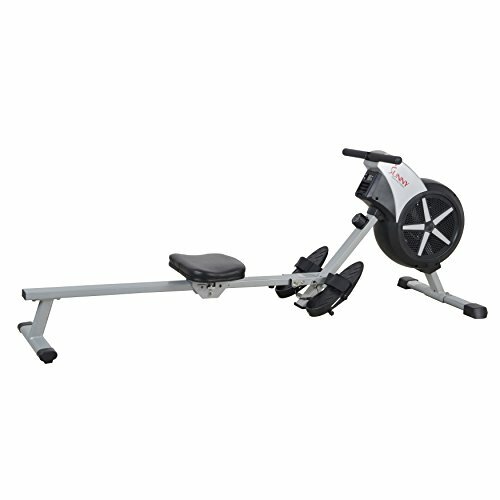 This rowing machine is uniquely designed with an integrated fan resistance system to respond with every stroke. As you stroke faster the fan will respond by spinning faster, increasing the resistance resulting in a more effective workout. The rowing machine also comes with an 8 level tension system to precisely increase the resistance. Track your workout progress with an easy to use LCD digital monitor that displays time, stroke count, calories, and average strokes per minute. A fully padded seat and non-slip handle bars provide optimal comfort and support for those long workouts. Slide rail length of over 47 inches can accommodate heights up to 6' feet 4 inch in. Large anti slip pivoting foot pedals with adjustable foots straps for more secure footing and mobility. Easy to fold and move in and out of the way with the integrated wheels. Receive an excellent full body workout without the impact on the joints. Row yourself into a new you with air rowing machine by Sunny health and fitness.